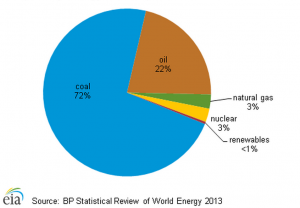 Home › Coal › South Africa: is the Future More Coal or Renewables? The African continent has a lot to lose with regards to future climate change. The twisted irony is that many of these countries are not major contributors to global emissions. However, this cannot be said of South Africa which, at roughly 500 MtCO2e/year, contributes 40% of the continent’s greenhouse gas. Similarly, 30% of Africa’s energy consumption is within South Africa. The energy sector is responsible for over four-fifths of South Africa’s emissions (85% in 2009). With 95% of Africa’s coal reserves in its borders, it is not surprising that nearly three-fourths of South Africa’s energy consumption is derived from coal. With this emissions profile in mind, greenhouse gas reductions related to energy – both production and efficiency – will be key drivers for South Africa’s emissions reductions. Low Carbon World, where strong action is taken globally and locally on greenhouse gas emissions mitigation. Not surprisingly, based on the phrasing of these four scenarios, South Africa’s intention is to be At the Forefront. In this plan, though coal continues to have a role in production and export, renewable and nuclear sources of energy are also developed. This is the aim, despite predictions that electricity generation costs for 2035 will be 8% higher than a More of the Same approach with coal as the sole source for expanding the generation capacity. South Africa aims to have a nuclear energy capacity of 9600MW by 2030. At present, the Koeberg nuclear plant capacity accounts for 1940 MW. The goal for renewable energy capacity is 18200 MW by 2030. The solar industry has recently been hailed as the world’s most attractive for investors. This is due to the government’s new Renewable Energy Independent Power Producer Program (REIPPP) which set a target of 84000 MW by 2030. It also allows Eskom to purchase power from private sources. As a result, South Africa’s solar industry is expected to grow from <1% in 2012 to 12% in 2020. By that time, solar will likely be the cheapest energy source available. This is good news, given the Coal Roadmap’s dire prediction that developing other sources of energy would raise the cost of electricity generation as compared to expanding coal as the only source.